When there is a large number of recorded videos and still images, it is difficult to look for the desired file from the index screen. Use the search function to find the file you want. 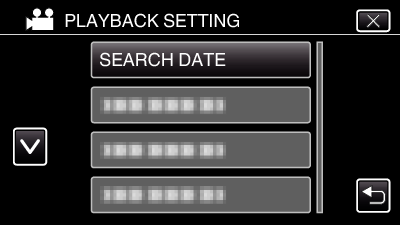 You can search and play videos or still images according to recording dates. 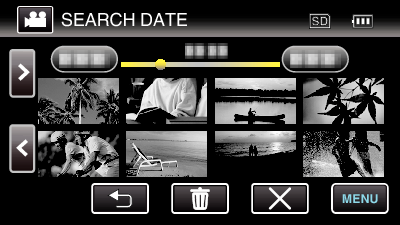 Searching can be performed in both the video and still image modes. *The image shows the video mode. Tap a recording date, then tap “NEXT”. Tap again to cancel the selected date. You can select videos in the video mode and still images in the still image mode. 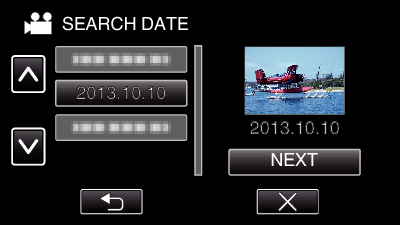 Only the files recorded on the selected date are displayed. Tap to stop searching and return to the index screen (thumbnail display). Tap on the index screen (thumbnail display) to delete unwanted files.